Seteikin Alexey Yu. 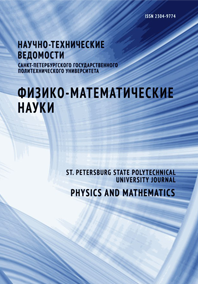 Fotiadi Alexander E. Privalov Vadim E.
A mathematical model has been developed. It makes possible to analyze the process of the threedimensional propagation of laser radiation in inhomogeneous media with a complex geometry using the proposed modification of the Monte Carlo method. The model also allows to carry out the calculation of the distribution of the absorbed laser energy density in multilayered materials with complex geometry and can be used in solving problems of analysis of thermal fields visualization. Those problems arise in irradiated tissues. laser radiation multibiological tissue Monte Carlo method ingomogeneity multiple scattering.